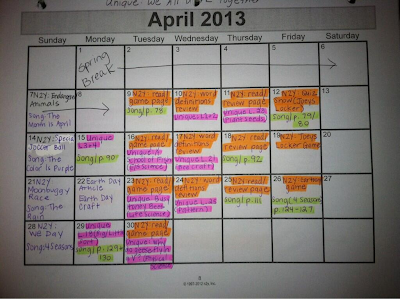 Well it's official, spring break is over and the final quarter is now in full swing! 40 more school days doesn't sound too bad..right?! Totally do-able! We had a conference comp day yesterday, so I spent a few very quiet hours in my classroom getting some stuff set for the month of April. I don't know about you guys, but this is my FAVORITE time to work in the school! You aren't exhausted from the day you just had, it's not the crack of dawn, and there is no one around to mess up your train of thought! My new goal for next school year: convincing our principal that we should have access on the weekends! 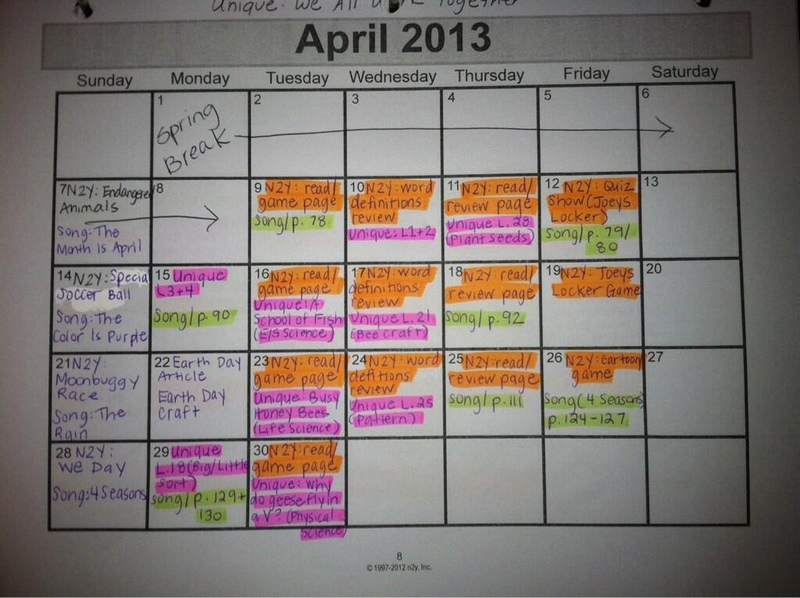 Anyhow, I was able to plan for our "whole group" time for the month of April. We started doing this more back in December. Our classroom schedule is totally crazy, and there is rarely a time where everyone is the room & we can do a full group! This is my favorite time of the day though. No "IEP specific" work, just fun things that are related to the Ohio standards and that my kiddos enjoy! Here's my (not so beautiful) monthly group plan for April! We typically stick to the same type of activities during our group time. I am in LOVE with News-2-You, so we do that 3 times a week at least. We read the weekly newspaper, do the game page, review page, and often they have fun games & cartoons relating to the newspaper! If this isn't something you have for your special learners, I would definitely recommend talking to your principal or director about getting it! Not only does it have all of the above, but there are also articles with symbols about every holiday you could think of, & tons of worksheets that they update weekly that I like to use for homework! We also use Unique Learning (same company as N2Y!) during our whole group. This month is all about working together through cooperative work and play. I go through and pick and choose the lessons each month that look most interesting to me. I don't use this as much as News2You, but it is still an awesome resource! The last thing that we just recently started doing during our group time is Rockin' With Robyn - Spring Songs! I found this hidden in my classroom and totally loved it. 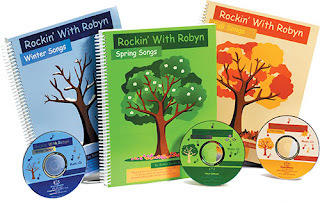 There is a song for each week of each month (so 4 songs for April) & tons of great Boardmaker worksheets that go along with the songs. They are pretty basic, such as circling things that begin with "A", or coloring the things that are green. Honestly though, some of those basic skills aren't visited very often & my kiddos still need continued practice. I was busy making their individual "April Books" yesterday at school!